McCann has worked magic here. Separate stories of people who seem to have absolutely nothing in common – Irish immigrants, Bronx prostitutes, members of a support group for women whose sons died in Vietnam, a judge, computer programmers in California, an Italian doctor – slowly overlap and converge. The slender thread that joins them is actually a cable: the wire on which Philippe Petit walked, ran, hopped, and danced between the towers of the World Trade Center. McCann’s skill at inhabiting the minds, hearts, and mouths of all these people is exceptional and deeply moving. 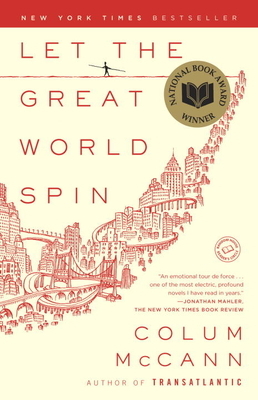 Colum McCann is the internationally bestselling author of the novels TransAtlantic, Let the Great World Spin, Zoli, Dancer, This Side of Brightness, and Songdogs, as well as two critically acclaimed story collections. His fiction has been published in thirty-five languages. He has received many honors, including the National Book Award, the International IMPAC Dublin Literary Award, a Chevalier des Arts et des Lettres award from the French government, and the Ireland Fund of Monaco Literary Award in Memory of Princess Grace. He has been named one of Esquire’s “Best and Brightest,” and his short film Everything in This Country Must was nominated for an Oscar in 2005. A contributor to The New Yorker, The New York Times Magazine, The Atlantic, and The Paris Review, he teaches in the Hunter College MFA Creative Writing program. He lives in New York City with his wife and their three children, and he is the cofounder of the global nonprofit story exchange organization, Narrative 4.